Need some quick kimchi? Or can’t find napa cabbage where you are? Try this kimchi recipe made with a head of your normal green cabbage. It’s light, crunchy, and refreshing! When napa cabbages are not in their prime season during the warm months, green cabbages (called yangbaechu in Korean, 양배추) come in handy for making kimchi. 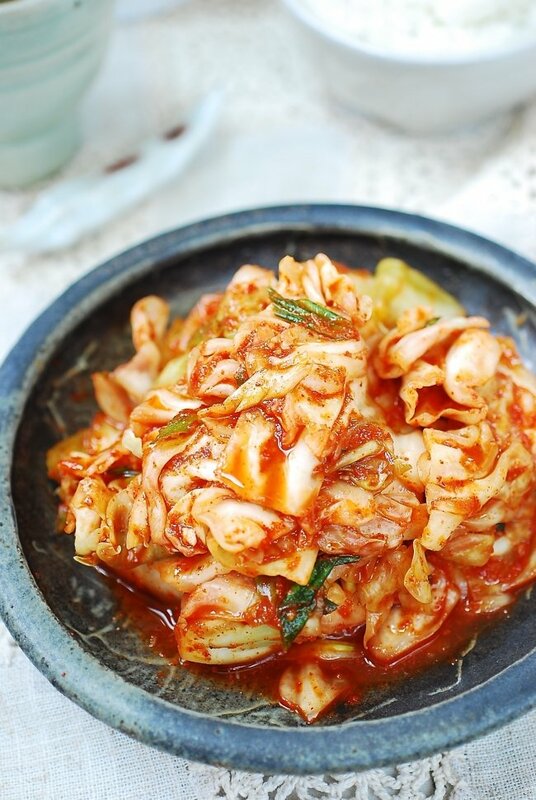 Great for kimchi beginners, this yangbaechu kimchi recipe is a good alternative if you can’t find napa cabbages at your local groceries or need a quick kimchi. The Korean name for green cabbage, yangbaechu, actually means Western cabbage. Green cabbages are healthy, naturally sweet and crunchy, which makes it a good vegetable for kimchi. This recipe was originally posted in July 2011. I’ve updated it here with new photos, more information, and an improved recipe. Unlike napa cabbage (baechu, 배추), you don’t need to salt green cabbage for very long. All you need is about an hour or two to soften the cabbage and bring out the flavors. 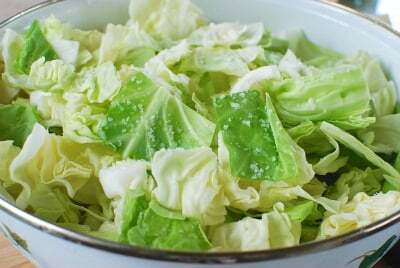 The salting time varies depending on the cabbage and the salt. Koreans use coarse sea salt (aka Korean brining salt) for salting vegetables to make kimchi. It’s natural salt with a coarse texture that was minimally processed. 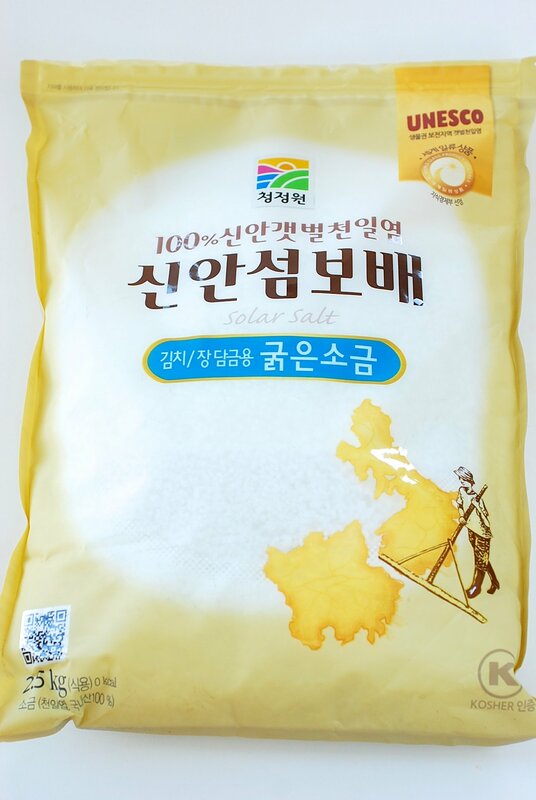 However, if Korean sea salt is unavailable, use your normal kitchen salt. If using finer salt, you’ll need to use less than what’s called for in the recipe. 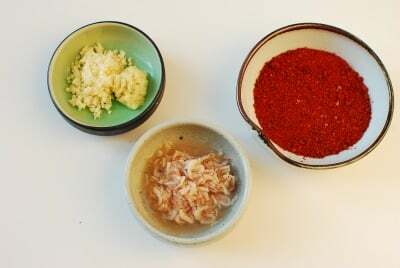 While Korean red chili pepper powder (gochugaru, 고추가루) is indispensable for authentic kimchi, this yangbaechu kimchi is a good kimchi for you to experiment with other types of chili pepper powder available to you. Some readers have reported a success with their substitution. Also, if your chili pepper powder is extremely spicy, puree some red bell pepper (or mild fresh red chili peppers) with a little bit of water and mix it with your chili pepper powder. It’ll give the kimchi a bit more red color and flavor. For a deliciously savory flavor, I used salted shrimp (saeujeot, 새우젓) in this recipe. Use fish sauce instead if preferred. For vegan kimchi, Korean soup soy sauce (guk ganjang, 국간장) is a good substitute. Many years ago while visiting my son who was in Berlin, Germany, at the time, I made this kimchi without any of these ingredients, and it was still very good! Yangbaechu kimchi is one of my mother’s favorite summer kimchi varieties, so we grew up eating it a lot. She would tell me not to use a lot of seasoning because this kimchi should be light and refreshing. However, feel free to increase the amount of gochugaru or salted shrimp (or fish sauce) to season the kimchi a bit stronger if preferred. Keep the kimchi out at room temperature for a few hours or overnight before storing it in the fridge. You can start eating yangbaechu kimchi right away, but it’ll taste better over a couple of weeks in the fridge. Because it’s lightly seasoned, it’s best consumed within 3 to 4 weeks. Remove tough outer leaves of the cabbage if any. 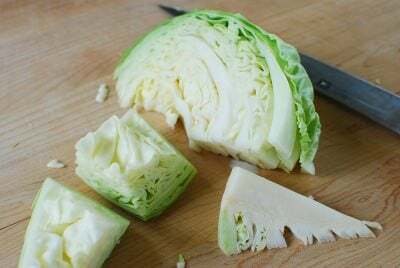 Cut the cabbage head into quarters and remove the core from each quarter. Cut each quarter into bite-sized pieces (about 2-inch squares). Rinse the cabbage and drain. Place the cabbage in a large bowl. Dissolve the salt in 2 cups of water, and toss well to coat evenly. Leave it for an hour or 2 until the cabbages have softened, flipping over once or twice halfway through or every 30 minutes. Rinse the salted cabbage once, and drain to remove excess water. Mix the chili pepper flakes (gochugaru), saeujeot, sugar, garlic, and ginger with 1/2 cup of water. Add the chopped scallions, the gochugaru mix, and 1 cup of water to the salted cabbage. Using a kitchen glove, mix everything well by hand until the cabbage pieces are well coated with the gochugaru mix. Place in an airtight container or a jar, pressing down hard to remove air pockets. Leave it out in room temperature for half a day or overnight. Then, refrigerate. This recipe was originally posted in July 2011. I've updated it here with new photos, more information and an improved recipe. I remember eating this when I was little. Now I understand why. So no salt huh? More healthy then I suppose. I haven’t eaten this for ages, just barely recall the taste. Debbie – 4 tablespoons salt is used to salt the cabbage, and then the cabbage is rinsed. So the salt on the surface of the cabbage and in the resulting liquid gets washed away. In other words, not all the salt used remains with kimchi. This is really full of flavor, and yes just like you said sound light and just for this time of year! My husband will enjoy this, he loves any cabbage dishes! Thanks for sharing! Pierre – Cabbage is presalted, and salted shrimp (or fish sauce) is quite salty. So you do not need salt to season it. Thanks. Sandra – Hope you give it a try. Thanks for stopping by. I have a big head of green cabbage in my fridge and I do not want cole slaw … this I believe, is what I will be making with it! This looks really good! 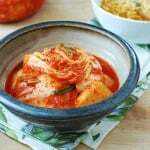 I love kimchi and would love to try making them at home!! We just saw you on food gawker and we are your newest followers. Thanks for sharing this recipe! Do you think I could use dried anchovies instead of shrimp? Also, how long can I keep this kimchi in the fridge? Miss C – If you don’t have salted shrimp, use fish sauce instead if you have any. Dried anchovies don’t have the pungent flavor that these fermented shrimp or fish sauce has. One time I made this kimchi while I was traveling in Berlin without any salted shrimp or fish sauce, but it tasted still good when fully fermented. The kimchi will last a few weeks in the fridge. I’ll try this recipe sometime soon. Adding kimchi juice into the mix will kickstart the fermentation process. Thanks, Jay! Let me know how it turns out. Hi – Hope you can help me with this question. I just finished making my first kimchi from your lovely recipe. I left my kimchi out for three days; I had read so many articles in making kimchi before I found your recipe that I missed your recommendation of 24 hours of fermentation time. My kimchi was starting to show signs of fermentation in 24 hours but I thought I was supposed to leave out for 3 days or even more. Also, I had very little liquid in my container. I found that recipes vary wildly from the brining process, sweetening and the time left to ferment. Can kimchi spoil? Thanks for your help and the easy recipe. hi Jill – Thanks for using my recipe! 3 days are way too long for kimchi to be left out in the summer time. I’m sure your kimchi is very sour after being out 3 days, but it should be safe to eat. If it’s too sour to eat, make kimchi jjigae (stew) or kimchi fried rice. Cooking will reduce the acidity a bit. 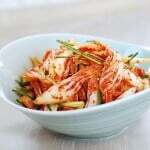 Adding a little bit of sugar while cooking kimchi will also help reduce the acidity. Also, if you’d like a little more liquid in this kimchi, add more water (season with a bit of salt) next time you make. Hope this helps, but let me know if you have any additional questions. I’ve been getting cabbages in my CSA produce box and we’re running out of ideas. LOL My husband loves kimchi but all the recipes I found was for napa cabbage. Thank GOD I found this. And now to the chili question. I can hop a town over to Korean market for it, I’m sure. But for the sake’s of others who don’t have access to Asian grocers (and of my sloth…hee), do you think we can substitute with a mixture of mostly crushed chili flakes, a little cayenne, and a pinch of sweet (or smoked?) paprika? Good quality gochugaru (Korean chili pepper flakes) is a must for authentic kimchi. But, the others might still work, although kimchi would taste quite different. Let me know how it turns out if you try. Thanks for stopping by! Chili flakes generally = cayenne, which is way too spicy. I’d cut the spice in half if you’re using cayenne. To get the dried pepper flavor, paprika is a good substitute to fill out the rest of the tbsps of gochugaru required. My wife’s tolerance for spicy food is limited, so I use paprika in place of some of the dried hot peppers required to get the pepper flavor without the heat, both for kimchi and anything else that calls for dried hot pepper spices. Hi there how long will it last in the fridge? It will keep well for 2 – 3 weeks or longer, depending on the salt level. Hi I always been curious about what Kimchi would taste like because i’ve never tried any before. So I was looking for a recipe and came across yours! It looks very simple compared to the others i found. I do have a couple of questions. 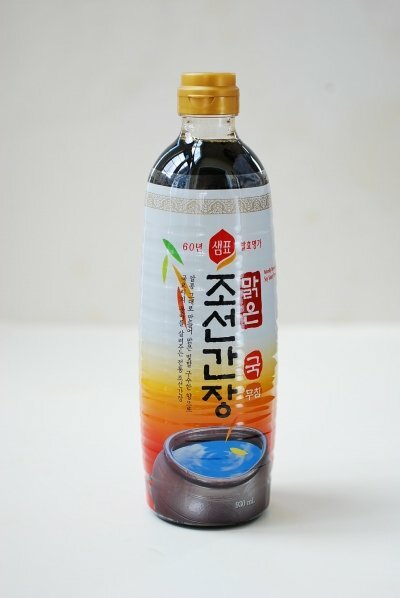 I don’t eat any meat or fish, can I soak seaweed in water to replace the fish sauce and what vegetarian Korean dishes can be made with kimchi? Thank you! You can simply omit the fish sauce. It will not be as pungent as Koreans like, but it will still taste good. Seaweed soaked water is a good idea to add flavor. I use it for my kimchi sometimes. 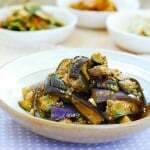 Korean dishes are very versatile. You can simply omit meat or seafood from most of them and make vegetarian dishes. Happy cooking! 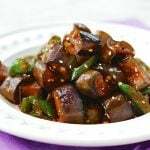 Is soy sauce or miso paste a great substitute for fish sauce and salted shrimp paste respectively? Not really. It’d be better to omit fish sauce or salted shrimp if not available. You can use a little bit of ground fresh shrimp if you want as it will ferment with the kimchi and add flavor. Hope this helps. 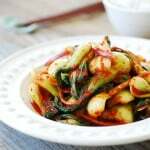 I have been looking for a long time a recipe for green cabbage kimchi, I’m so glad I found yours! This is the easiest recipe that I have found and the shortest time that needs to be fermented. The kimchi turn out great, I love it. Thank you for sharing this recipe. Hi Danielle – You’re welcome! And thank you! I’m so happy to hear your kimchi turned out great. I look forward to hearing more about your Korean cooking. Cheers! Easy but great recipe. Such complex mix of flavors. 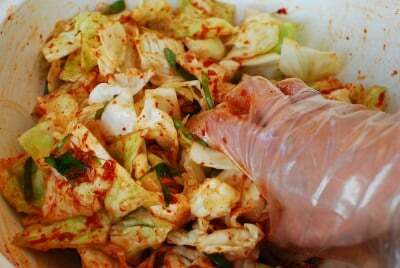 Now that is cabbage season is time to take advantage of such marvelous vegetable, that is kimchi or slaws… Thanx. We traveled in S. Korea for 5 weeks, and loved everything about the country, especially the food. I’m so glad to find this recipe, as I live in Mexico where we do not have napa cabbage in the stores. Can I substitute any dried red chile for Korean red chile flakes? Like the kind of dry red chile sprinkled over pizzas? We are so happy with this recipe. It was easy to make and tastes delicious. As we live in Mexico where there is no Asian grocery store nearby, we did not have Korean red pepper chili flakes. We substituted New Mexico red chili powder, brought back from a recent visit to Santa Fe. Since we are chili wimps, we only used half the amount of chili powder called for in the recipe. We also substituted fish sauce for salted shrimp. It is still very good, and looks just like your photo. Thank you for a great recipe. This will become a staple and a reminder of our 5-week visit to S. Korea. Hi Kathleen – first let me apologize. I somehow had missed your first comment, so I didn’t answer your question. But I’m so glad you tried the recipe with New Mexico chili powder and liked it. And it’s great to know kimchi still taste very good with other chili powder. I’m sure my readers would love to know that. Thank you so much for taking the time to share your love for Korea and its food and to let me know how the recipe turned out for you! Cheers! May I know is this the normal cabbage that you are using or the sweet cabbage? I’ve often make the traditional kimchi and for a change would like to make this. 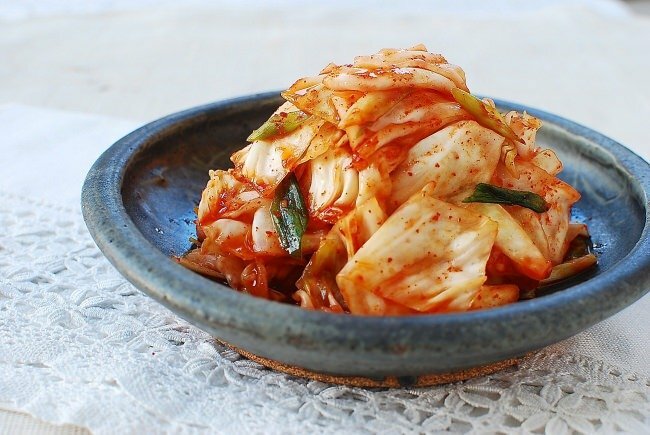 There is another type of kimchi called white kimchi. Do you by any chance have the recipe? Hi delia – yes, this is the normal round green cabbage. This would be a nice change. I hope to get to white kimchi soon. Stay tuned! Thank you so much! 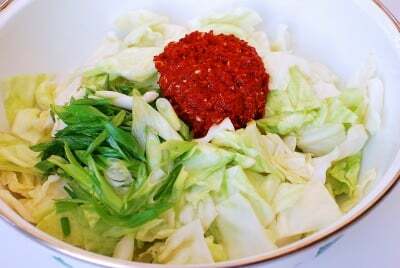 Having been stationed in South Korea, I have enjoyed many Korean dishes and I am eager to try making the round green cabbage kimchi. Hi Spence – It’s very easy to make it, and you’d be glad you tried it. Thank you for stopping by! This looks so good. I’m going to have to remember your recipe the next time I run out of kimchi and all I have is green cabbage around me. Thanks for sharing! Hi Julie! It’s quick, easy and still delicious! Hope you try it. Thanks for stopping by! I really love this recipe. Wanted to let you know that I featured it in my monthly round-up of 25 Deliciously Healthy Low-Carb Recipes. I hope a lot of my readers will come over here and try it! Thank you, Kalyn! You’re totally awesome!! I’ll come over to read your monthly round-up. I know they are always full of delicious, healthy recipes. Looking forward to trying my first kimchi this weekend! How do Korean red pepper flakes differ from regular? Guessing that I won’t be able to find the Korean variety, would I use an equal amount of regular pepper flakes? Thanks in advance. Not sure what you are referring to by regular pepper flakes. Are you talking about those that people use to sprinkle over pizza or pasta? If that’s the case, it won’t work with kimchi. Kimchi takes finely ground red hot pepper flakes or powder without visible seeds. There’s almost no substitute for Korean red pepper flakes for kimchi making. Did you try on-line for Korean pepper flakes? I love this recipe, and have made it a few times. Great flavor, good texture. I recently bought some Kim chee from the store, and it had that sour, tangy, “fermented” taste. My kim chee doesn’t have much of that flavor, is there something I can do to bring it out? When/where does the fermenting happen, after it’s jarred, in the fridge? Leave it out at room temperature longer before putting it in the fridge, maybe 2 to 3 days, if you like it to ferment fast. Otherwise it will take about a week to 2 weeks for this type of kimchi to develop sour flavor. Hope this helps. I made the yangbaechu kimchee recipe last week and it is still too salty. More salty than the normal kimchee flavor. I followed your recipe exact, as I have made it once before and had the same problem before. I used salted shrimp and left it out for about 24 hours in a cool/room temperature room, then put it in the dark back of my refrigerator. Since this recipe is to be consumed within 2-3 weeks, I am worried it will still be too salty to consume. Can I add radish to the mixture to absorb the salt or is there something else you recommend? Thank you! I love your website! You can add more cabbage or radish. Don’t worry about 2 – 3 weeks. And also keep it out to help ferment faster. Saltiness goes down a little as the kimchi ferments. What kind of salt do you use? I want to add regular thin chopped or shredded carrot. When should this be added– with the cabbage and salt at first or later with the scallions? I buy a brand that has carrots and it is very nice (similar crunch as Daikon radish). And I saw one recipe that adds fresh pear or apple slices which is interesting idea – not sure if best to just add fruit when eating or if these can be also added with the scallions and ginger. Your ideas on adding fruit would be appreciated. I’ve tried making green cabbage kimchi before but didn’t let it sit with salt long enough and it was too crunchy. I also didn’t have the Korean chili flakes so used some other flakes and it is definitely not the same taste as the Korean flakes. If left at room temp longer I assume it just ferments and needs to be checked before it ferments too far? Refrigeration stops the ferment. Thanks for this easy recipe! Will be making it this way tonight. You can add later with the scallions because shredded carrot doesn’t need to be salted. You can add fruits later with the seasoning. Yes it should be checked and placed in the fridge. It will continue to ferment in the fridge although refrigeration slows down the process. Hope this helps. Hyosun ssi, hello and thank you for posting so many delicious recipes! I’ve tried some Korean dishes and fell in love with their flavour, but didn’t get the chance to try kimchi. Unfortunately there are no Korean restaurants where I live and it’s almost impossible to find napa cabbage either. So I was excited to find your recipe for green cabbage kimchi and I tried making a batch. For the same reasons I mentioned before I didn’t use Korean pepper flakes but a local kind of pepper flakes, which are similar in consistency though. I know this will make it taste different but I hope the result is still good. I wanted to ask you a couple of questions about the fermentation process. Considering it’s winter time, I have kept the container at room temperature for around 3 days, then put it in the fridge. I have checked and tasted the cabbage everyday but since I’ve never tried kimchi before, it’s difficult for me to tell when it’s “ready”, that is, when it’s actually at a good degree of fermentation. I noticed that the smell has become more pungent and the taste has turned a little sour, and the cabbage has released water which has gotten a little bubbly. Also, every time I check it I usually press down the cabbage so that there’s as little air as possible inside the container, but only the bottom half of the cabbage layers is submerged in water, while almost half of the top layer is somewhat dry. Is this normal, or should the whole cabbage be wet? I see no mould on the top but I was curious about how it should look after 4-5 days. Thank you for reading my message and for your wonderful blog and sorry for the long post! 정말 감사합니다! Hello Rob – It’s great to hear you’re trying to make kimchi with whatever the ingredients you can find in your area. From what you’re describing, it sounds like everything is going well and your kimchi is ready to be eaten. This type of kimchi does not have enough liquid for the whole thing to submerge in water. It’s normal. It should have generated enough liquid to keep the cabbage slightly wet though. If you like a little more liquid, add some water next time. For now, take some out from the bottom to eat and press the remaining kimchi down every time you take some out. Hope this helps. Thank you so much for your reply! I will keep your suggestions in mind. I have eaten some kimchi yesterday evening and it was very good; the taste is very refreshing and somehow addictive. As you said, the whole batch is indeed wet: just the amount of liquid is not enough to submerge the whole cabbage. 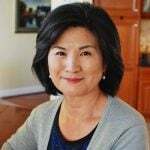 Thank you again for your help; your blog is absolutely my favourite source of authentic Korean recipes and I visit it very often to try new dishes. Have a nice day! I am so thrilled to hear your kimchi was very good! And, thank you so much for your love for my blog. Happy Korean cooking! I am so glad I found this recipe! 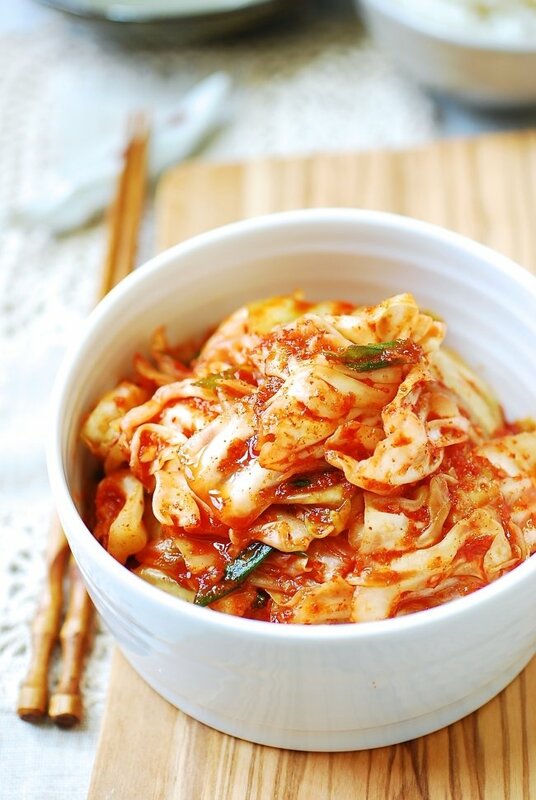 I simply can not stand Napa cabbage…absolutely hate the stuff no matter how it’s prepared and the hubs was just talking about wanting me to make some Kimchee….I will happily use this recipe and see how it turns out. I might have to special order the chili flakes and salted shrimp as I live in the mountains of TN and I am positive that NO ONE in a 100 mile radius would be carrying what I need. Any suggestions on a good online source for those two things? Hi! I am about to venture into making my own kimchi. I love kimchi and prefer it to sauerkraut. I want to eat it for its fermented and nutritional value but I am surprised that you recommend leaving it out only for 24 hours. Some recipes for fermented foods say a couple to three weeks. Would you please elaborate, Hyosun. Thank you! It will continue to ferment in the fridge. You can start eating any time, but it will taste best after two or three weeks. If you leave it out too long, it will ripe and become sour very fast. Hope this helps. I’m looking for a recipe for a dish served in my favorite Chinese restaurant. It was served as an appetizer alongside the regular kimchi. While the kimchi is salty and hot, this was sweet and didn’t have the peppers to make it red. It was green and also fermented. The owners of the restaurant retired, so I don’t even know what the dish is called. Can anyone point me in the right direction? I live in a tropical country where every day is summer day? (30-33 degree celcius here) Do you think it’s okay to put my freshly made kimchi straight to the fridge? I’m afraid if I put freshly made kimchi in the room temperature it will be so sour. Yes you can put it in the fridge right away, but the first few hours (maybe 4 to 5 in your case) at room temperature should be fine. Enjoy! Hi, Hyosan. I became hooked on incomparable Korean cuisine while stationed on Oahu in the Air Force, and especially while on temporary duty in South Korea for 6 weeks. 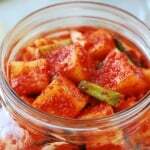 I have made many traditional types of kimchi and MOST of my family and friends love it. Dumb question on this recipe: Am I correct that one cup of water is used for the gochugaru mixture and that an additional cup of water is added afterward? Gamsahamnida! Thanks for sharing your story! Yes, you’re right about one cup of water for each step. Sometimes, I like using just regular head cabbage. My recent batch consisted of cabbage, daikon, onion, green onion, ginger, Thai chile, habanero, Korean chili powder, gochuchang, garlic, salt, plum brine (from homemade umeboshi), fish sauce, shrimp paste, roasted rice flour, and some other ingredients. It was ready in 5 days. It probably helped that the daikon had already been lacto-fremented. Really like the texture and consistency the rice flour added. Really, really good! Thanks for your posts! Love the recipe.. and i have a jar of gochujang which i cant seem to use up.. can i use the gochujang in kimchi recipes? How will it change the taste? I see three kinds of green cabbage at the market. Regular round-head green cabbage, with smooth leaves. Broad, flat-head cabbage that is very pale green, almost white. Savoy cabbage, round head with dark green curly leaves. What kind of green cabbage do you like to use for this recipe? Thank you! Where do you find broad, flat-head cabbages? They are available at Korean markets around here. I’ve made this kimchi with both regular round-head and flat-head cabbages. Flat-head ones are tenderer and sweeter, while normal regular ones are a bit peppery and crunchier. Try with both types and see which one you like. I haven’t tried making kimchi with savoy cabbage, but I’m thinking it may be too tough for this kimchi. The Hmong farmers at the farmer’s market sell the flat cabbages. I’ll give them both a try. Thank you for the advice! Hello Hysoun imo and everyone! Yesterday I tried making kimchi. I followed the recipe till the salting step ( I salted for 2 hours). After that, I used a kimchi base I found at a store. I left it on my kitchen counter overnight in a covered container. This morning, when I tasted the kimchi, it tasted bitter. Any ideas why and how I can fix this? Thanks. Green cabbage is sweet, so I’m not sure where the bitterness came from. It could be the salt you used or something in the kimchi base. 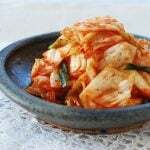 The bitterness may decrease as the kimchi ferment and develop flavors. However, you can try to add some sugar now to balance it out if you want. I have attempted this recipe just now with half a head of cabbage and adding water two times later made it very watery. I see everybody else saying that it is dry. I have adjusted the measurements according to the size of cabbage. Is extra water OK? If I have to drain it slightly then what can I do with the water? Extra water is okay. It probably diluted the seasoning, which is okay. The cabbage will release liquid as it ferments, so it doesn’t need all that extra water when making it.